I love this, can’t wait to try these products. I love your blog and appreciate all the information you put out there. I’ve only been natural for 1 1/2 years and I’ve learned so much reading your blog and a few others. For the first time this week I wore my hair in twists to work — I learned about those from you – and the compliments have been bountiful. As much as I’ve enjoyed that, I have to draw the line when people ask if they can touch my hair 🙂 Thanks again for the time and effort you put into this. Awwwww, than it so awesome!!! Thank you for sharing!!!! 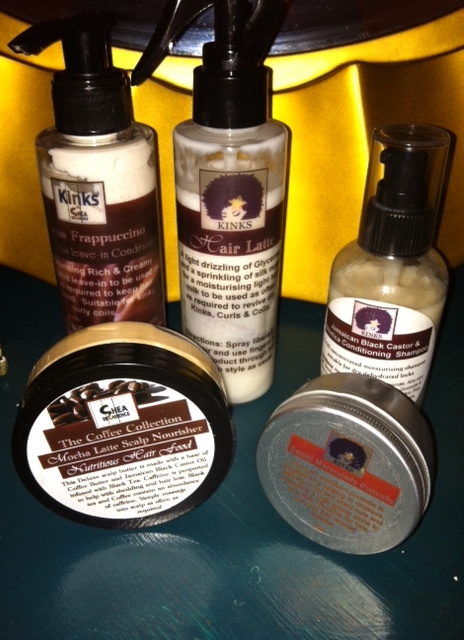 Thank you for taking the time to review the Kinks Range and for such a glowing review!! I forgot to add, your hair looks mighty juicy!! You are a lovely and patient woman Sharron!! Glad to be able to share your products!! And thank you!! My journey to find the right products to feed my thirsty locs finally began with Shea Decadence. I called Sharon to advise me on which products to try, and she was very helpful and thorough with her knowledge and recommendations for my hair. I ordered the following products; Sweet Marmalade Pomade, Root Nourisher & scalp syrup, JBC & Nilotica Condtioning Shampoo and HairLatte Coditioning Hair Milk (smells divine) all of which work hand in hand to moisture & condition my locs. I love these products. Without a doubt these products are SHEA DECADENCE!!!!! Pingback: Behentrimonium methosulfate is not a 'sulfate' | Get your Sizzelle on!